Yoga is an ancient practice that has been studied for many years and has proven health benefits for its practitioners. Yoga encourages you to breathe properly while paying close attention to your exercises and sharpening your focus. Its unique exercises and positions help you connect your body and mind while toning your muscles. With the help of a professional yoga instructor Dubai, you will be able to build strength improve your flexibility and decrease the level of everyday stress. 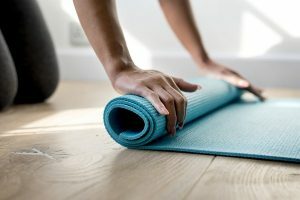 If you have never tried doing yoga, it may be that the idea of relaxing and unwinding from everyday troubles with soothing music has crossed your mind more than once. And we must say it was for a good reason. Due to its great health and fitness benefits, yoga has, during the past few years, become more and more popular all around the World. If you are looking forward to becoming a Yogi, Dubai PT is here to help you find the best instructor there is. Pain and stress relief is one of the most common reasons people hire a yoga instructor Dubai. Lowers the risk of digestive problems. Better sleep quality. By reducing stress yoga help you stay calm and sleep better. Promotes self-care. Yoga promotes self-compassion and positive thinking. Boosts energy. 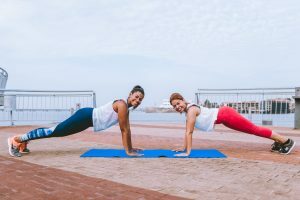 With a professional yoga instructor Dubai to plan your personalized yoga training plan, you will be able to improve your fitness, reduce the stress and improve the quality of your life. Inflexibility in muscles can cause chronical pain. With regular yoga workouts, you can improve your flexibility and relieve the pain at the same time. Not only that being more flexible will improve your workout routine by time. But it will, also, have a positive impact on your everyday life. With the help of our website, you can find a cheap trainer that will help you improve your flexibility and health. Regular physical activity by exercising yoga can help you lose weight. Even though it is considered to be a low-intensity workout routine, you will be burn calories. Also, yoga will allow you to control your weight. Therefore some people decide to look for power yoga Dubai studios, as this type of exercises are more intense and allow them to improve their usual workout routine. Many women decide to enroll in prenatal yoga classes not only to find a good weight management solution. But, also, to stay healthy and reduce everyday stress. As yoga improves your flexibility and overall health you will be able to decrease chances for any injuries. Also, as there are many different types of this ancient practice, it can be optimized for any age, gender, and physical condition. This allows people with various health conditions to manage to improve their fitness and have regular physical activity. Yoga poses help you improve the strength in your muscles as well as to tone your body. Don’t be fooled by the mat and images of people doing the stretch exercises. As there are many exercises that require you to use various muscles in your body at the same time, yoga will help you improve your strength. Yoga has proven successful in helping with anxiety and depression. Its specific and various exercises will also help you relieve pain. Therefore, if you are looking for best back pain exercises, or have troubles with your ankles or knees, we recommend you find yourself a reliable yoga trainer. This way you will manage to get rid of the pain and become more flexible at the same time. Inflexible muscles cause bad posture and back pain. With a regular yoga routine and a great personal trainer in Dubai, you will strengthen your muscles and even be able to breath better. Yoga relaxation exercises can improve your blood flow. This is extremely important for older people and the ones that have problems with the circulation. Relaxation and breathing exercises will help you lower your blood pressure. While some poses can stimulate your abdominal organs like kidneys. Exercises can lower your bad cholesterol and increase the good one. This will have a positive impact on your blood sugar and a heart condition. Yoga promotes a healthy diet and helps you create a regular workout routine. Relaxation exercises will lower your stress level and help you develop better sleeping habits. As an ancient practice, yoga has changed and evolved during the centuries. Therefore, nowadays you can find private yoga instructor Dubai that practice its various types. From power yoga that is a fast-paced exercise to Hatha yoga that represents the basic form of this ancient practice. Various types of modern and ancient yoga allow you to find the right class and instructor that meets your needs and fitness goals. If you start searching for a yoga instructor in Dubai, you will come across many personal and group coaches. But, how to choose the best one? As a team of health and exercising experts, we take this matter quite seriously. Not only that we recommend you look for a licensed professional, but we also want to encourage you to compare more than two instructors. By evaluating their credentials, experience, and techniques you will be able to find an affordable trainer in Dubai that will meet all of your requirements. Yoga is so much more than just a set of exercises. It is a lifestyle that includes relaxation, self-care, and growth. That being said, it is quite obvious then you need more than just a great app to help you stay healthy and motivated to work out. You need a personal instructor that will be able to support and cheer you on your path of self-improvement. When looking for a great yoga instructor Dubai, you need to search for a highly-trained expert that can help you set realistic and specific goals according to your requirements and capabilities. The best way to start looking for a yoga trainer is to decide which type of yoga you want to practice. As there are many different exercise routines, you should research and find out which ones are available in your area. This way you will avoid signing up for an advanced class or practicing a routine that you might not like. Just by being skilled and experience a specific coach might not be the best choice for you. Your yoga instructor Dubai needs to be more just someone who presents various exercises. You need a trainer that will know how to motivate and support you. Therefore, make sure you trust your instincts. Choose the instructor you trust, and you will become a Yogi in no time!